It does have one broken ang el charm on it though. Huge CHARMS ,CHARM BRACELETS. And oh the CHERUB CHARM IS ADORABLE! THERE ARE 2" CAGE " PENDANTS FOR SEAGLASS ETC. . although the seaglass is not included. THERE ARE 4 BRACELETS, 2 NECKLACES, 5 PENDANTS, 2 PAIRS OF EARRINGS, 5 RINGS AND 1 BARRETTE. ALL MARKED. 925 OR STERLING. VERY PRETTY. This lot has SINGLE Rhinestones in settings. Great lot for creating jewelry with more than 100 pieces in the lot. No two lots are alike, they were scooped out of a mix so sizes and colors will depend on what was in the scoop. There is everything -big big mix. IF I KNOW THE ITEM HAS A FLAW I NOTE THAT IN THE TITLE. 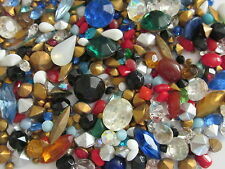 The rhinestones and solid colored stones are various colors, shapes and sizes. There are hearts and other shapes and they range in size from large to tiny and from plain to fancy. These RHINESTONES date from around the 1950's. I just have too much to even go through so passing it along. The pictures above are just a small SAMPLE of my collected Treasure. FOR CLARITY-. Lot of 5 (Five) Random pieces from estates I acquire and sort. Shown in picture: red earrings missing one small rhinestone. Blue earrings have a rhinestone in place of a blue one. DETAILS: Over 3 lbs. 28 mixed pieces in this lot. 12 necklaces, 6 pairs of earrings, 5 brooches, 1 sterling ring, 2 crosses, 1 bracelet, and one beaded belt. NOT JUNK,ALL WEARABLE AND IN GOOD OR GREAT CONDITION! NECKLACES, EARRINGS, BRACELETS. PICTURES ARE JUST A SAMPLES, I WILL PICK RANDOM NECKLACES, EARRINGS, BRACELETS, BROOCHES. LOT OF 8 READY TO WEAR JEWELRY. I am not a jewelry or antique expert. I describe as best I can and feature lots of pics. CHECK OUT ALL THE PHOTOS! Excellent Pre-Owned All Wearable Condition! WHATEVER YOU SEE IN THE PHOTOS, IS EXACTLY WHAT YOU WILL GET! Jurassic Fossil. AN DA SLIVER CLAD/PLATED. if you are buying gold banknotes. HUGE MIXED LOT. FIRST UP IN THE LOT. ALSO 3 UNCHECKED RANDOM FOREIGN WORLD COINS. 1 WHEAT PENNY WITH A RANDOM DATE AN D ABICENTENNIAL QUARTER BOTH IN A COIN PROTECTORS. 100% are Swarovski/Austria crystals. This lot has SINGLE Rhinestones in settings. Great lot for creating jewelry with more than 50 pieces in the lot. This lot has a number of different shapes, there are PEARS, Marquise, rounds etc. The brooch is 2” x 1 ⅝” with a lovely lady carved into the back of the. beveled glass cabochon and then put into a pronged setting. Matching earrings dangle ⅞” and are clip-ons. LOT 801... NICE..UNSEARCHED, UNTESTED ALL WEARABLE JEWELRY LOT. This is a nice lot of all wearable used jewelry.May show age,wear or may need cleaning. Lot of Rhinestone hearts, cross, flowers. and more. We are not, nor do we claim to be experts in any field related to the item for sale. 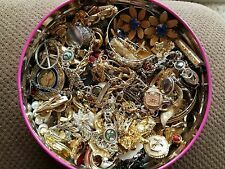 vintage costume jewelry lot Necklaces. Shipped with USPS Priority Mail. A nice huge all wearable lot of Vintage to Modern jewelry in lovely vibrant pink colors. 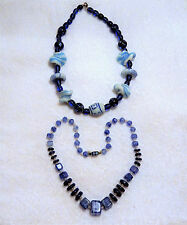 There are some nice necklaces, wood beads, some plastic, a few new pierced earrings, several bracelets and more. See all photos. A very nice lot, comes from a clean smoke free home. I gladly combine shipping to save you some money, just let me know. Mississippi residents wait for invoice for 7% Sales Tax. Thanks. FASHION RINGS. BEAUTIFUL LOT OF 20 ASSORTED FUN~TRENDY~PRETTY ~POSH. APPROPRIATE AGE WEAR SHOULD ALWAYS. APPROX : 5 1/2 to 10. ALL ARE PRE ~ OWNED AND MAY HAVE BEEN WORN. 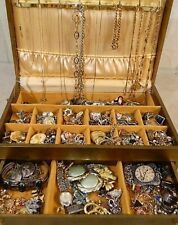 Vintage Estate Jewelry With Jewelry Lock Box & Key (Coro, Monet, Lisner, other). Has 2 keys and us in working order! Box has some wear and measures about 12 inches x 4 inches x 3 inches . Thats just an eyeball measurement. Be aware. There are signed pieces of coro, monet and a beautiful lisner brooch. There's various unsigned pieces as well. I did not see any precious metal but i didnt test for any either. Please note all jewelry may have wear and need cleaning. This is an AS IS LOT and comes as is. No returns. 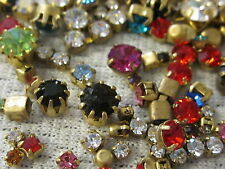 100 VINTAGE RHINESTONE & MORE SINGLE EARRING CRAFT LOT (2.8 pounds). Shipped with USPS Priority Mail small Flat Rate Box. 7 pair are clip-on & 1 pair is pierced. Gold tone with clear beads & gold tone balls is missing a bead. 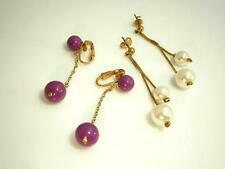 Gold tone pink beads & off-white faux pearls signedTrifari with crown. 2 pair of Christmas clip-ons, one on original card - both signedJapan. 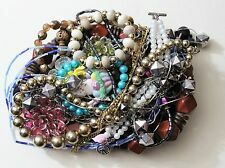 Lot 802... NICE..UNSEARCHED, UNTESTED ALL WEARABLE JEWELRY LOT. I am not a jewelry or antique expert. All Sterling pcs are marked and/or tested. Excellent Pre-Owned All Wearable Condition! WHATEVER YOU SEE IN THE PHOTOS, IS EXACTLY WHAT YOU WILL GET! A couple of the ring bands are slightly bent. See photos. All Rhinestones intact. Donald Stannard clip on earrings, sterling heart shape screw back earrings. 6 pair earrings. lots of sparkle in this lot. 4 necklaces. 1 6 b a g s o f 2 0 o r m o r e e a r r i n g s i n e a c h b a g. W e h a v e 1 6 available. When you buy it now w e w i l l s e n d a r a n d o m b a g t o y o u. T h e earrings are as is and a l l paired u p a n d i n pretty g o o d s h a p e.
There are 68 Pieces In this Collection. Earrings count as 1 piece! There are 5 sets in this collection. Glass Bangle Bracelets. Ciner Necklace & Pendant (pendant is not signed, only the necklace). So who knows what you will find. I pull out all broken and junk jewelry and that is put into a craft lot. The signed pieces are sarah cov, monet(2), Bob Mackie, Florenza, Avon(2), 925, napier. Silver and gold tone. I inspected them as I can see all stones are intact. When planning a great outfit, it is essential to consider all of the details, such as your accessories. Once of the most commonly forgotten components is the jewelry required to complete the look. Costume jewelry is a terrific way to accessorize an outfit without breaking your budget. Sellers on eBay offer a variety of costume jewelry lots that enable collectors to add multiple pieces to their collection at one time. With so many great additions, you'll have stunning pieces for every outfit in your closet. One of the benefits of costume jewelry is that it closely resembles jewelry created from real gemstones. Choose from a wide array of beautiful stones to replicate a look you adore at a fraction of the price. Replica pearls, cubic zirconia, and synthetic sapphires are just a few popular selections that look as amazing as the real gemstone. Rhinestones are another lovely option that results in a gorgeous piece of jewelry. Retro costume jewelry lots incorporate a large amount of jewelry into a single lot. These lots contain a blend of authentic vintage pieces and reproductions. The reproductions closely resemble some of the most popular pieces of costume jewelry from years past. If you prefer authentic costume jewelry from your preferred time period, look for lots specifically labeled with jewelry crafted during that time period. 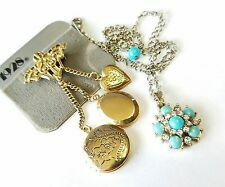 Choose from listings that include worn jewelry and those that include brand new pieces. When you think of costume jewelry, you may envision earrings, necklaces, rings, and bracelets. Though these are all popular items, your options for costume jewelry are much more extensive. Brooches, pins, and ear cuffs are all gorgeous enhancements to your favorite outfit. If the thought of matching various pieces to one another sounds cumbersome, look for lots that come with costume jewelry sets. Make your Halloween extra spooky this year and shop for Halloween decorations, goody bags, and retro costume jewelry collections to take your party to the next level.